In order for the ceremony not to be too lengthy EACH school will choose ONLY ONE AMBASSADOR of its chosen countries to give the opening speech. More information will be sent to you via email. 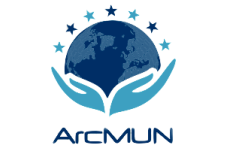 You should send your opening speech at the address: arcmun.secretariat@gmail.com. Please send a copy translated into GREEK as well. It's our honor and privilege to invite you all at the 17th Conference of Thessaloniki MUN by Aristoteleio College, a conference to be held in March 2019. Every year, hundreds of students attend Aristotelio College MUN to debate upon some of the most significant matters the international community faces today. This programme is made for those of you who have dreamt of becoming a diplomat or just have an interest in educational experiences and wish for an effective tool to learn about the complexities of the world. But what is the Model United Nations? Well, it's an authentic simulation of the UN General Assembly and the other multilateral bodies. Practicing in Model UN promotes students' and teachers' interest in international affairs and the relevant subjects, increases the ability of students to engage in problem solving, teaches aspects of conflict, amplifying research and the comminication skills and finally creates the opportunity to meet new people from different schools and possibly make new friends.